Yes, I’d say I use up a few ripe bananas in this house, but recently, when I went to make bread, my all-purpose flour was nearly gone. I decided to use a good ole fashioned cake mix that I keep on hand in cases of emergency. While I typically lean 100% homemade if I can, there are times when shortcuts are the perfect sanity saver. This was definitely one of those times and we all loved it. You can keep it a basic recipe or throw in some pecans and/or chocolate chips to add texture like I did above. 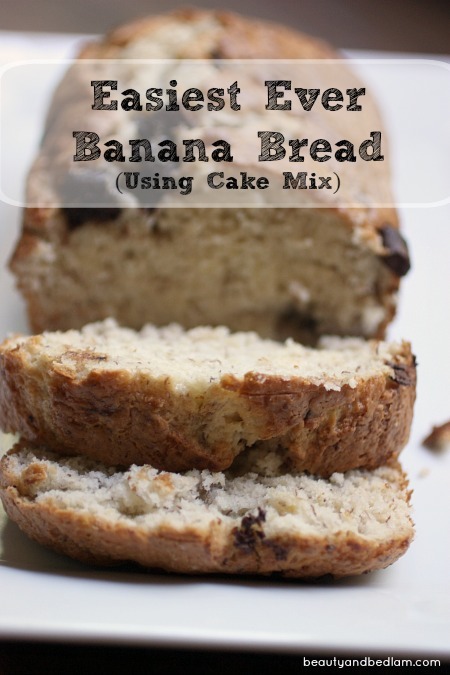 Summary: Using a box cake mix streamlines the prep time on this delicious quick banana bread. In a mixing bowl, combine the cake mix with egg and milk. Add bananas, beat for two minutes. Stir in pecans or chocolate chips, if desired. 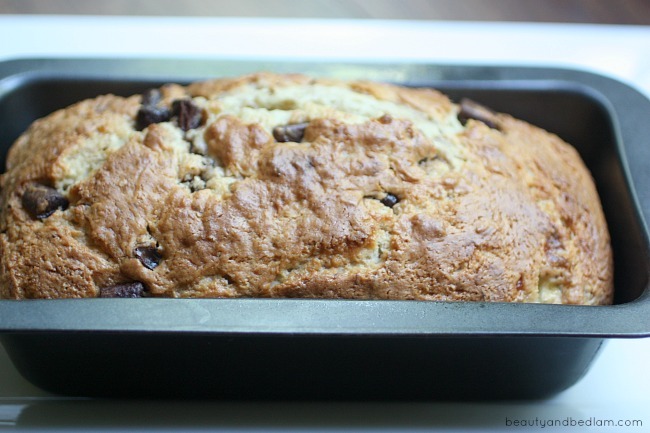 Pour into two greased 8×4 inch loaf pans. Bake at 350 degrees for 40 – 45 minutes or until toothpick comes out clean. Cool for ten minutes before removing from pan. Continuing cooling on wire rack. This is one of my pinterest fails. I tried it once and the center of my bread collapsed. Really? Was that with this exact recipe? It’s frustrating when that happens, but I bet it still tasted yummy. I wonder what went wrong since the core of the recipe is a cake mix. Perhaps the cake mix was used after it’s best before date? That’s the only thing I can think of!!! Mine stuck to the bottom of the pan (on both loaf pans) even though I sprayed generously with oil spray. It was also really hard to cut. I followed the recipe exactly. I think I might use parchment paper next time to pull it out easily. 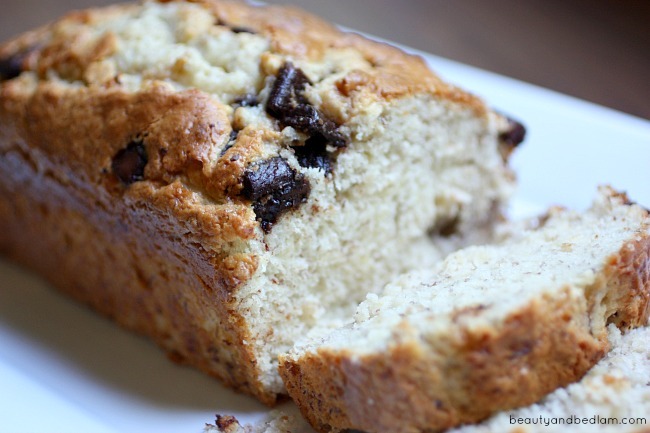 Regardless of the minor mishaps I had, the banana bread was deee -licious!